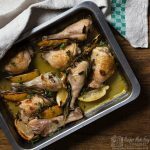 The garlicky, tangy juices that this lemon, garlic and herb baked chicken produces are so delicious make sure you have something to mop them all up, they are too good to waste. This was the very first recipe I published on Recipes Made Easy, but as I had taken the pictures on my phone it has to be said that they were not exactly great. For my first recipe, I had opted to share one of my favourite fall back recipes that I often turn to when I want something quick and easy. However thanks to those early pictures the recipe was not getting the love it should, so last time I made the dish, I decided to takes some new pictures and republish the post. It’s too good to have hidden in some dusty corner of the web. The great thing about this recipe is not only does it make a great mid-week meal, it tastes good enough to share with friends when entertaining informally. You can easily up the ingredients to cater for larger numbers. It’s simple but does rely on using good basic ingredients. I always use free-range chicken, yes they cost a bit more but I really do think they taste better (and lets not go into animal welfare). Even Free range chicken drumsticks and thighs are relatively cheap compared to chicken breasts. For the most yummy tasting juices, use a good quality olive or cold-pressed rapeseed oil and fresh herbs. To make the dish all you need to do is prepare all the ingredients and pop them in a roasting tin. You can prepare it up to this point up to 24 hours in advance, cover and keep in the refrigerator. 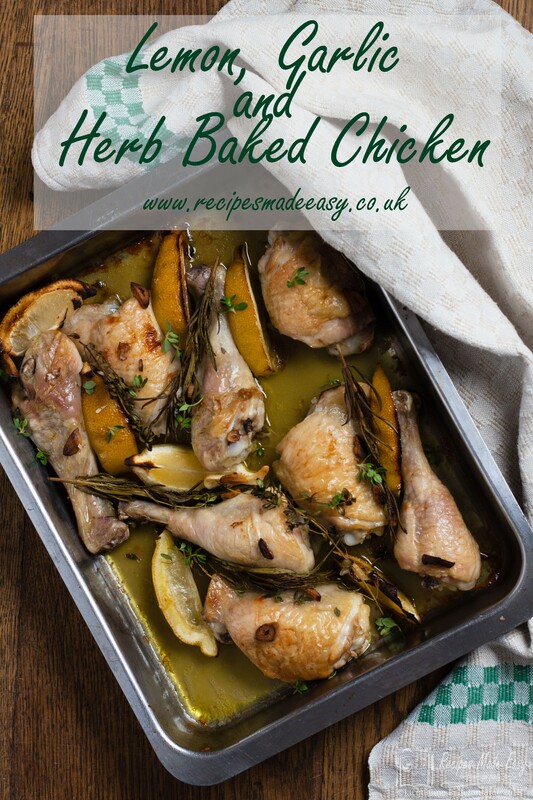 Then when your ready simply uncover and pop the tray in the oven and bake for 35-40 minutes or until the juices from the chicken run clear when pierced with a skewer. I serve this with new potatoes, oven roasted chips, rice or crusty bread with a simple salad or green vegetable, just depending on how the mood takes me. 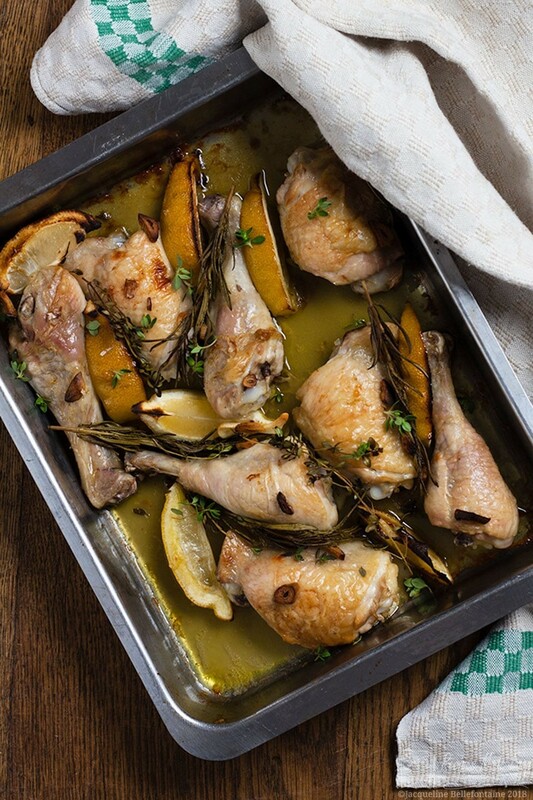 Oven baked chicken portions flavoured with lemon garlic and herbs. Quick and simple to prepare, this dish is perfect for a quick mid week meal. 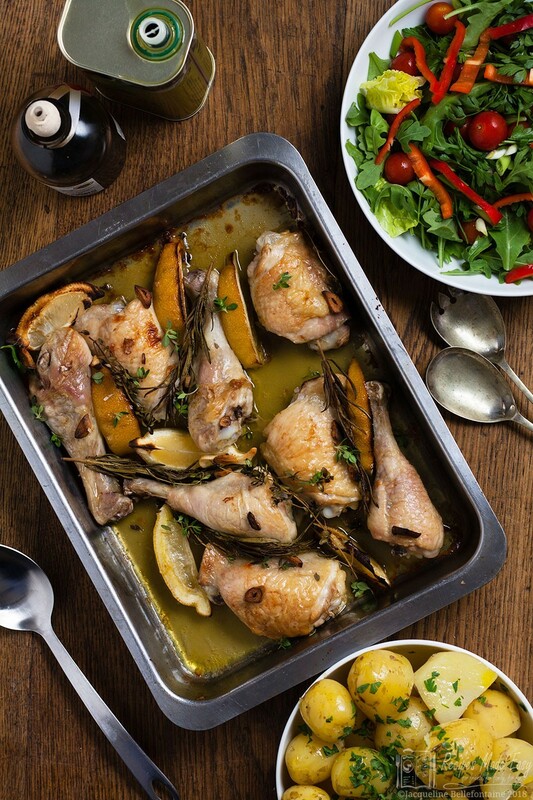 Place the chicken pieces in a shallow roasting tin, tuck the lemon wedges and sprigs of herbs in between the chicken pieces and scatter the garlic slices over the top. Drizzle the oil over the chicken and season with salt and pepper. 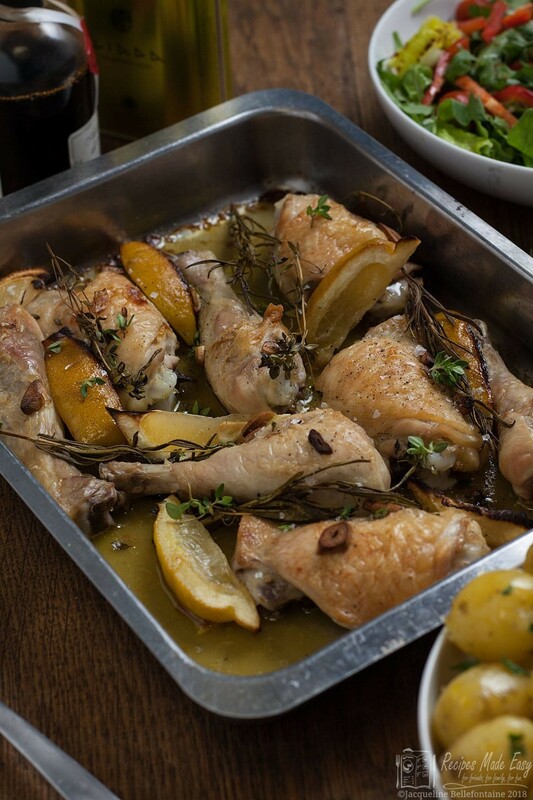 Roast in the oven for 35–40 minutes or until the juices from the chicken runs clear when pierced with a skewer. Serve with the juices spooned over. I serve this with new potatoes, crispy potato bites or rice with a simple salad or green vegetable, just depending on how the mood takes me. Baked Lemons bring such an incredible flavour to dishes, gonna have to try this yummy recipe! Oh I agree baked lemons give a delicious tang to dishes. I really hope you like this one.